The past couple of weeks have been a little crazy with deadlines to meet, conferences to attend and write papers for, and just the general start-of-summer holiday craziness. Sure, as a postgraduate student you never have holidays anyway, but thinking that the holiday season is starting at least helps to calm your tired brain down a bit haha. Right, so having been so busy, I haven't really had much time to spend in the kitchen, but I really felt like eating something simple rather than canteen food this evening. 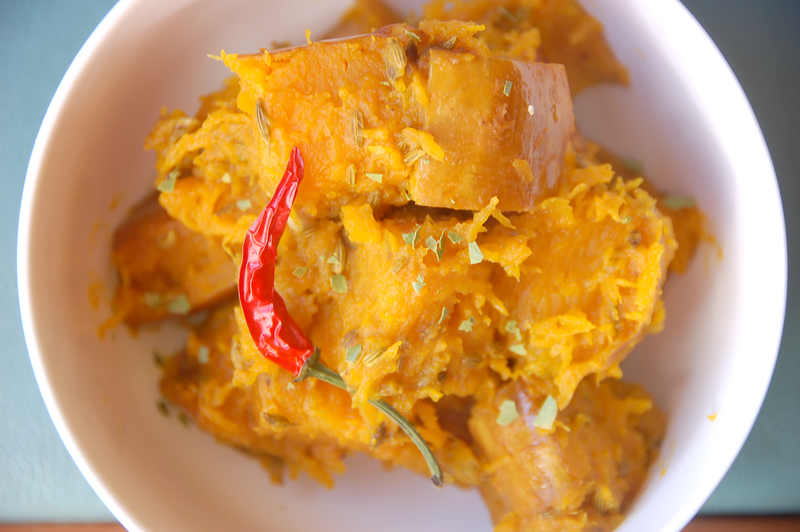 I searched through my fridge and realized that there was a bit of butternut squash in there, and so I put together this very simple Indian-inspired Fennel Seed Squash dish. It's quick and easy to make and tastes great if you like that strong taste of fennel seed. I should also say here that I highly recommend keeping the squash or pumpkin skin on because it'll give it that extra bit of crunch that cooked squash lacks on its own. Heat oil over medium-low heat in a frying pan. Add fennel seeds and lightly fry for a few seconds until fragrant. Add bite-sized pieces of squash to the pan, along with a bit of salt, turmeric, and garam masala. Stir through to coat the squash with the spices. Add a tablespoon of water to the pan, cover, and lower heat. Simmer for 15-20 minutes until the squash becomes fork-tender. Careful not to overcook it or it will turn into mush. Add the juice of half a lemon. Stir-fry for a few seconds to evaporate the rest of the water and to give the squash a bit of a crisp texture. Garnish with the kaffir lime leaves and serve with chapatti, pita, or just plain ole sandwich bread.